The Pitchandi Poornamaalai Ammal Trust was founded by our eminent Chairman, Mr.P.Selvaraj who ascended the ladder of success through his hard work and dedication. The trust comprises of eminent industrialist who have propelled themselves to glory in their respective domain. The Pitchandi Poornamaalai Ammal Trust actively entered in the field of Education in 2001 to create awareness on the importance of education among the economically weaker sections of the society living in Muthiahpuram / Mullakkadu villages. As a first step it started the Chandy Matriculation School (2001) followed by Chandy Industrial Training Centre (2003), Chandy Polytechnic College (2005), Chandy College of Education (2007) and Chandy College of Engineering (2009).The Pitchandi Poornamaalai Ammal Trust was founded by our eminent Chairman, Mr.P.Selvaraj who ascended the ladder of success through his hard work and dedication. The trust comprises of eminent industrialist who have propelled themselves to glory in their respective domain. The Pitchandi Poornamaalai Ammal Trust actively entered in the field of Education in 2001 to create awareness on the importance of education among the economically weaker sections of the society living in Muthiahpuram / Mullakkadu villages. As a first step it started the Chandy Matriculation School (2001) followed by Chandy Industrial Training Centre (2003), Chandy Polytechnic College (2005), Chandy College of Education (2007) and Chandy College of Engineering (2009). 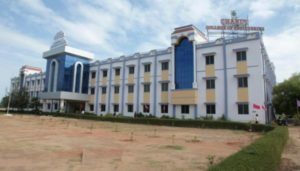 Chandy College of Engineering offers excellent ambience for young learners to realize their dreams in an affordable cost. The rapport between management and faculty members is a healthy one and the management firmly believes in the participative and democratic style of administration. Frequent parent teachers meetings are conducted to monitor the progress of the students and an internal quality assurance cell is continually reviewing the progress of institutions to improve its performance.